The Westland Yeovil was a biplane day-bomber designed and built by Westland Aircraft in 1923 to meet an Air Ministry Specification for a single-engined day bomber. The Yeovil was designed to meet Air Ministry Specification 26/23 for a single-engined day bomber, with a Rolls Royce Condor engine specified by the ministry. It was a two-bay staggered biplane of composite wood and metal construction. It had a crew of two with the pilot in a cockpit at the front with the bomb aimer/gunner behind. It was powered by a nose-mounted tractor 665 hp (496 kW) Rolls Royce Condor IIIA piston engine, fitted with a Leitner-Watts metal propeller. A feature of the Westland Yeovil was the high-lift section gravity tanks. The nose sloped from the pilot's cockpit, and gave him a good view. The rear gunner was clear of the wings and had a wide range for firing, as well as a clear view downwards for bombing. 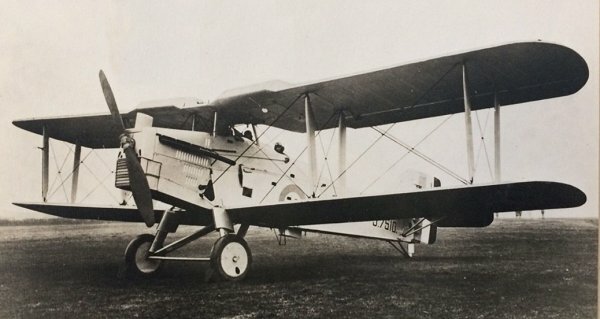 Three prototypes were ordered, the first prototype J7508 made its first flight in 1925 from RAF Andover, with Captain Frank Courtney as the test pilot. The prototype was delivered to RAF Martlesham Heath for evaluation against the other aircraft built to meet the specification, the Hawker Horsley and the Bristol Berkeley. After evaluation the Yeovil and Berkley were not ordered into production, the Horsley had already been given a contract against a different specification. The three Yeovil prototypes continued to fly for a few years for research and testing. One gun firing forward and two guns firing backward. The Westland Yeovil day-bomber. This is the first of the three prototypes, registered as J7508. .... and seen from the rear. .... and a contemporary postcard of third prototype, J7510.